Why just have magnificent plant pots in the garden? Brighten up your home with beautiful flowers and plants in our stylish and colourful products. Most of our planters and pots can be used indoors. Pots can be made without drainage holes and a self watering system can be added to ensure that your exotic plants remain in perfect condition. Some of our planters even have concealed wheels for easy moving around the home. 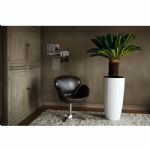 Grow citrus, palms and other lovely house plants and trees in our pots or choose from our range of artificial plants which are incredibly realistic.